Last week the Federal Open Market Committee (FOMC) has made substantial changes to its monetary policy statement. In a nutshell, the FOMC has signaled to shift to a wait-and-see approach regarding future changes in its monetary policy rate. Whether the Fed will further increase the federal funds rate in 2019, as indicated by the Fed’s economic projections from last December, is therefore very much data-dependent. The outlook for the US economy continues to be favorable, though, the risks to the outlook have recently shifted to the downside. In December the FOMC has increased the target range of the federal funds rate to 2.25-2.5 % and judged that “some further gradual increases […] will be consistent with sustained expansion of economic activity”. Risks to the growth outlook have been seen as “roughly balanced”. The Summary of Economic Projections of the Federal Reserve Board members and Federal Reserve Bank presidents have indicated two rate hikes in 2019 and one additional hike in 2020. By the end of January, the FOMC’s assessment has changed quite a bit, compared to December. This time no indication of further gradual increases of the federal funds rate have been made, rather emphasizing the data-dependency of future policy changes. There are three main reasons why the Fed has shifted to a wait-and-see mode. Firstly, inflation pressures have been described as muted with the Personal Consumption Expenditure (PCE) Core Inflation being below but nevertheless close to 2 %, the Fed’s inflation target. Moreover, market-based measures of inflation expectations have moved lower even though survey-based measures have remained broadly stable (Figure 1 - see pdf). Secondly, risks to the economic outlook have shifted to the downside. Financial conditions have tightened considerably in December, particularly so for corporations with lower credit quality. US non-financial corporations with a credit rating of single B currently face a refinancing yield of 6.5% compared to 5.2% a year ago (31st January 2018). Corporations with high levels of debt have been mentioned by President Powell as a macroeconomic risk, as highly levered firms can amplify a negative downturn when financial conditions tighten. Moreover, global growth has slowed down, not only in Europe but also in China, with potential spillover effects to the US economy. Besides lower global growth and tighter financial conditions, political risk have intensified. Uncertainties regarding the effects and outcome of Brexit, US-China trade negotiations and the US government shutdown contribute to the assessment that risks are titled to the downside. The third reason why the Fed has shifted to a wait-and-see mode is uncertainty regarding the neutral level of the federal funds rate. With the last rate hike in December to 2.5 %, the upper target of the federal funds rate has reached the lower end of estimates for the neutral rate. The median longer-run federal funds rate, or neutral rate, was 2.8 % with a range from 2.5 to 3.5 % in the Fed’s Summary of Economic Projections in December. Hence, given that the range of potential neutral rates has been reached the FOMC has decided to “put aside [their] own priors what that rate might be and let the data speak”. The Fed faces a somewhat contradictory picture as the economic outlook remains favorable, yet downside risks have intensified. In this environment, the FOMC decided to patiently wait for greater clarity, instead of pointing towards some further gradual increases in the federal funds rate. 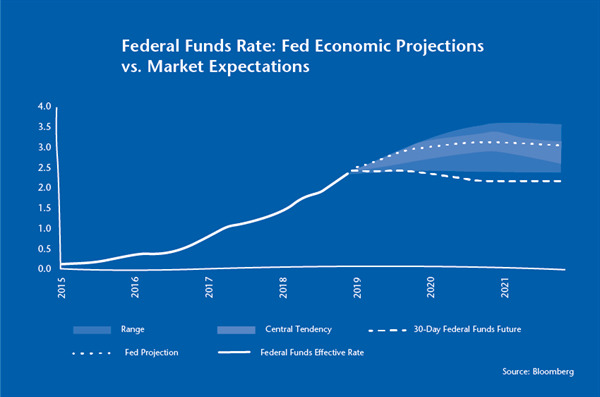 Federal Funds Futures reflect an end to the rate hiking cycle even pointing towards a first rate cut in 2020 (Figure 2 - see pdf). New macroeconomic projections will be published alongside the next FOMC meeting in March, which will shed light on how the Committee members see the future trajectory of the federal funds rate. In the meantime, the Fed will closely monitor “a wide range of information, including measures of labor market conditions, indicators of inflation pressures and inflation expectations, and readings on financial and international developments”. Last Friday’s labor market report is an important piece of evidence and points towards the sustained strength of the US economy. In January total nonfarm payrolls increased by 304 thousand, which was well above market expectations (165 thousand). The 3-month moving average has gradually increased over the last few months (Jan: 241k, Dec: 232k, Nov: 194k). Moreover, wage growth remains strong at 3.2 % (y/y), thus, confirming a positive trend. The unemployment rate has increased to 4.0 % from 3.9 % in December, which can be linked to a 0.1 %-age point rise in the labor force participation rate reaching 63.2 %. The labor market report supports the current assessment of a job picture, which continues to be strong with the unemployment rate near historic lows and with stronger wage gains. Apart from the FOMC’s update on the future path of the federal funds rate, the January monetary policy meeting has brought some insights on balance sheet normalization. The Fed started to reduce its balance sheet in October 2017 after it had reached more than USD 4.5 trillion. Over the longer run monetary policy is intended to be implemented through an abundant reserve system, the federal funds rate being the active monetary policy tool. The supply of reserves is, thus, not managed actively. The ultimate size of the Fed’s balance sheet will be determined by currency in circulation, financial institutions’ demand for reserves and a buffer. The level of reserves demand is quite uncertain, though, expected to have increased over time. Thus, balance sheet normalization might be finished sooner than has previously been anticipated (USD 3.5 trillion). The optimal timing of the balance sheet runoff is currently debated, hence, a final decision has not yet been made. When asked during the Q&A session President Powell refrained from providing an indication of the equilibrium balance sheet size. However, he emphasized that the balance sheet has gained its place in the conventional monetary policy toolbox, even though, the federal funds rate remains the active monetary policy tool. Overall, the January FOMC meeting has shown substantial changes to the Fed’s forward guidance. Further gradual rate hikes, which have still been on the table in December, have become less likely. The future stance of monetary policy is very much data-dependent and the FOMC has shifted to a wait-and-see mode also assessing whether the current level of the federal funds rate shows the characteristics of a neutral level. The equilibrium level of the Fed’ balance sheet and the timing of the balance sheet runoff is currently debated. Economic growth has continued slowing in Austria. In Q4 2018, real GDP expanded by 0.2 (q/q, seasonally and working day adjusted) and 2.0 % (y/y). Previously, quarterly GDP rose by 0.4 % (Q3) and 0.7 % during the first half of 2018. During the total of 2018, GDP increased by 2.7 %; equaling growth in 2017. There are no expenditure details yet released based on the Eurostat methodology. The Austrian Institute of Economic Research (Wifo) published the smoothed GDP trend-business cycle-component. According to that, both domestic demand and net exports contributed to growth. Real GDP rose by 0.4 % (q/q) after 0.4 % in the previous quarter. Household consumption and fixed investments increased by 0.3 % and 0.5 % and exports and imports rose by 0.4 % and 0.3 %. Despite the moderate business cycle slowdown, growth is well balanced as all expenditure components contributed to the expansion. On the supply side of the economy, industrial production has lost steam and stagnated, while construction rose by 0.5 % (q/q) in Q4 2018. The cooling poses downside risks to official GDP growth forecasts for 2019 (Wifo: 2.0 %, IHS: 1.6 %). Annual GDP growth of 2 % would be based on a significant rebound during the first half of 2019. External demand is likely to soften amid a growth slowdown in the Euro Area. A positive shock to domestic demand could be based on higher household incomes and consumption after generous wage negotiations in the last autumn and the introduction of the family bonus by 1st January 2019. On the other side, if quarterly growth settles at the previous rate or further slows, official estimates will see downward revisions for 2019. In the Euro Area, economic growth did not recover in Q4 after weak expansion in Q3 2018. Real GDP increased by 0.2 % (q/q) and 1.2 % (y/y). In the entire year 2018, GDP increased by 1.8 % after 2.5 % in 2017. Among Euro Area countries, which released Q4 results, Spain’s quarterly GDP rose by 0.7 % (2.4 % y/y) and France’s GDP increased by 0.3 % (0.9 % y/y). Italy’s economy contracted for the second consecutive quarter (-0.2 % q/q after -0.1 % in Q3) and it stagnated in y/y-terms (0.1 %). German statistics office (Destatis) did not release Q4 2018 national accounts yet, however, it released total 2018 GDP at 1.5 %. According to that, GDP would have increased by 0.1-0.4 % (q/q) in Q4. Based on the results of the other Euro Area countries and a linear regression, we estimate that the German economy contracted by 0.1 % (q/q) in Q4 2018, what contradicts the earlier Destatis release for annual 2018 GDP and might also imply that revisions are ahead (Figure 3 - see pdf). However, this is only indicative and shows not more than uncertainty around the final outcome. In summary, the Austrian as well as the total Euro Area economy continued to expand until year-end 2018, however, at a slowing pace. Italy entered a mild recession during the second half of last year. Earlier expectations about a quick growth rebound after temporary factors dragged growth in Q3 (German automobile sector) did not materialize. There is some uncertainty around Q4 GDP growth in Germany, in our view. Some recent survey indicators posed a warning signal about the business activities earlier this month. Our in-house nowcasting model produces an out-of-sample forecast for Q1 GDP growth of 0.3 % for the Euro Area, i. e. a mild recovery.